Tawantinsuyu, the name that the Inka gave to their empire, covered an enormous and diverse territory that extended from the northern sierra of Ecuador to the Maipo River in Central Chile, and from the Pacific Ocean to the eastern slopes of the Andes Mountains. In this vast dominion of the most diverse landscapes imaginable, the Inka had access to a wide range of resources. Their religious and political capital was located in Cuzco, and it was from here that the famous Inka Road system radiated outward to the empire’s four provinces, Chinchaysuyu, Kontisuyu, Kollasuyu and Antisuyu. The Inka economy was based on the mita labor tribute system that required all subject communities to provide a given amount of free labor. This usually meant working the land, but also included mining, craftwork and other activities. This form of tribute to the Inka State was recorded on a quipu, a set of knotted cords used with a decimal numbering system to keep track of economic information. Agriculture was central to the Inka economy, and was often practiced with complex systems of terraces and irrigation canals. The output produced by subject communities was divided into three parts: one was given in offering to the gods and priestly caste, another to the State (the Inka sovereign) and the last third was kept by the laborers themselves. Livestock was another important commodity, especially the herds of alpacas that provided the hair from which yarn was spun and woven into cloth, and the llamas that formed the caravans that moved all kinds of goods throughout Tawantinsuyu. 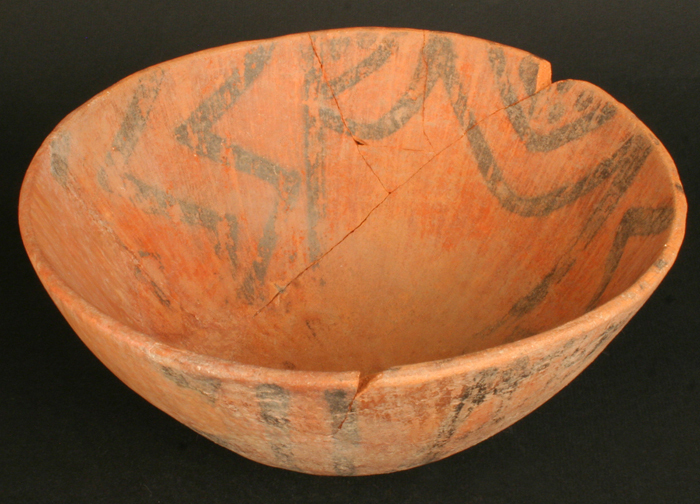 The Inka produced art in many forms, but ceramics, textiles and metals are especially important ones. Notable among their many ceramic traditions is the Inka Imperial style, manufactured in Cuzco. 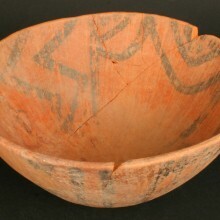 These pieces had a cream-colored finish and red and black painted decoration that usually consisted of geometric motifs such as “fern” patterns or lines of diamonds. 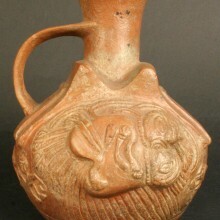 One of the most emblematic Inka ceramic vessels is the aríbalo or maka, a narrow-necked jug with flared edges, a spherical body, two handles and a narrow base. 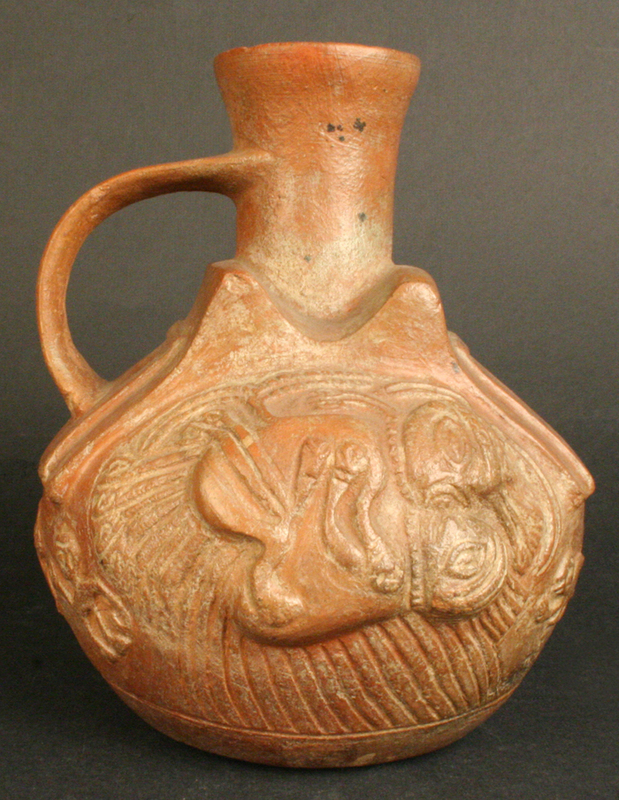 These jugs often were made in the shape of a feline and were typically used as containers for chica, a locally-made fermented beverage. The finest examples served as prestige goods, and were given as gifts by the Inka ruler to seal alliances or to maintain relations of reciprocity for political purposes. Textiles were also highly valued in Inka society. The most prized of these were made of multicolored alpaca or vicuña wool using a variety of techniques and decorated with geometric figures. Metal crafts, especially copper, gold and silverwork, was also highly developed in the Inka empire. Some well known examples are the human and camelid figures made of noble metals and left as offerings on high mountain shrines and the tupus, pins used to hold women’s blankets. They also produced a wide array of objects used for ceremonial and ritual purposes. In the outlying provinces, local versions of many of these items were made, particularly ceramic pieces, which disseminated the Inka esthetic and political-religious symbolism while in many cases incorporating regional stylistic patterns. Inka society was based on a two-tier system, in which each community and the State itself was divided into two parts: hanan was the upper segment, and hurin the lower segment, and each had its own leaders. The Empire was led by the Inka sovereign and his lineage or panaca, followed by the priests, the Cuzco aristocracy, and the nobles of subject provinces and ethnic groups. The Inka State itself was organized into ayllus or clans, groups of individuals linked by kinship and governed by a leader, called a kuraka. Special social classes included military personnel, the aqllas (women who were chosen to serve the Sun God and the Inka himself), and a myriad of government bureaucrats such as those responsible for keeping accounts on the quipus or quipuqamayoc. At the base of this very hierarchical social structure were the peasants, who often served as colonists (mitimaq), retainers (yanas) and slaves. Religion played a central role in Inka life, and this was manifested in the pantheon of deities such as Wiraqocha the creator, Inti the sun god, and Killa the moon god. The Inka also deified stars in the heavens and natural phenomena such as lightning. They revered their ancestors and treated the bodies of deceased leaders with great care, burying them in special sites. In general, Imperial policy allowed conquered cultures to retain their customs while making official Inka rites and ceremonies mandatory as well. The Inka are well known for performing special rites on high mountain peaks that often included the ritual sacrifice of specially chosen individuals, who were buried on the summit with a rich array of grave goods. The Inka power structure was manifested in architectural patterns that were reiterated throughout the Empire. Buildings were usually made of stone worked in varying degrees, although in some places adobe or thatch were also used. Inka buildings usually had a rectangular floor plan, with trapezoidal doors, windows and vaulted niches. The roofs of these structures were gabled. Other Inka structures included the kancha or open area, used for rituals of institutionalized reciprocity. In each zone the Inka built an administrative center or remodeled an existing one. The Inka capital of Cuzco was a planned city, with administrative services, buildings, palaces and residences. The Inka ruler lived there with his court and servants, along with an estimated 300,000 other inhabitants. One of the Empire’s unifying elements was the Inka Road (Camino del Inka or Qhapaqc Ñan) a road network with two trunk lines running north-south (one along the coast and the other in the highlands), branch roads running east-west, and side roads to smaller localities. The road ranged from 3 to 15 meters wide, with some segments cobbled and some of packed earth, and included stairways in steep sectors and bridges over ravines and canyons. Inka roadside inns, called tambos, and rest stops, called chasquiwasis, served those who traveled along the Inka Road, especially the official messengers, known as chaskis. The Inka people originated in the groups that inhabited the Cuzco Valley in the Late Intermediate Period. These groups began to expand their territory by conquering neighboring peoples, and eventually formed one of the most extensive Empires of antiquity. The Inka established many different kinds of relations with different ancient peoples, and their strategy of conquest included diplomacy, reciprocity (through gift-giving) and alliances, although all of these approaches were backed by the presence of a strong and highly experienced armed force. In 1532, the Spanish conquistadors arrived on the coasts of Peru and, led by Francisco Pizarro, took advantage of the conflict between two factions—one led by Huáscar, the other by Atahualpa—and in a few short years put an end to the Empire known as Tawantinsuyu. 1470 - 1532 d.C. Horizonte Inka. Estilo Inka local. Horizonte Inka. Período Tardío 1470 - 1532 d.C.